Here is a quick look at some of the technology I found at the Quality Expo International trade show in Rosemont, Illinois. 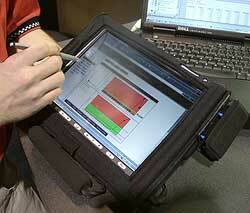 This cool rugged pen tablet runs Windows CE and can be used for data entry on the shop floor or anywhere. By collecting information directly into a computer, without a paper form, you can eliminate the paper cost and storage. Custom forms can be designed in minutes. Has a 6-8 hour battery life. 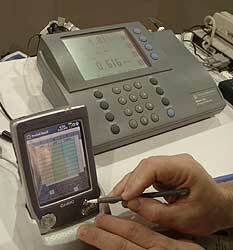 Using a standard Casio Cassiopeia CE device, data can be collected from digital gauges, meters and laboratory equipment. By simply sliding the PDA into the RS-232 docking cradle for each instrument, data is directly transferred to the PDA device. There is no need for paper forms that can be inaccurately filled in or lost. A more advanced version of the Labtronics Collect software is available for laptop use. Based on a Palm platform (Handspring), this one piece hand held device assists workers to precisely perform color quality control. This is a 2.2 pound portable color spectrophotometer that takes only seconds to collect an accurate measurement. 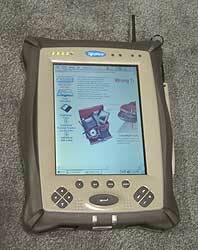 This Pentium III powered, Windows 98 tablet is useful to take notes, measurements and function as a portable notebook computer.